Time seems to have passed Phnom Penh, once dubbed the Pearl of Asia," by -- with colonial French architecture untouched by modern day life, beautifully wrought pagodas with sparkling ornamentals and staggering monument complexes that have forever made Cambodia famous. The capital of Cambodia, the city overlooks three bustling waterways; the Mekong, Tonle Sap and the Bassac River, all of which boast crowded riverfronts that beckon tourists and locals, alike, with street food vendors lining the streets flanking the parks, selling everything from spiced curries to noodle bowls. Unlike Siem Reap, the allure of Phnom Penh doesn't lie in the temples -- but the city's resilience. Tarnished and shattered by war and revolution, the city has spent the better part of 30 years trying to rebuild -- and in turn, has welcomed influence from hundreds of other cultures, making this bustling city a true cultural melting pot. The first few moments in the city will bring an onslaught of sensual overload -- with the sounds of motorbikes whizzing by, the smells of different street food stalls hanging over the air and the ever-changing buzz of monks in scarlet robes passing by and locals pushing past you to get to the market or work. It can be overwhelming, but once you get the hang of the city's pulsing heartbeat, it's nearly impossible to not fall in love with the old-style charm and fortitude of Phnom Penh. Although the people and the city have fought to shed the demons of their past, the stark memorials to the reign of Pol Pot are all over the city -- and the sadness that hangs over every monumental landmark -- from the Killing Fields to the Tuol Sleng Genocide Museum. Visiting these places is crucial to understanding the horrifying history that still plagues so many Cambodians -- lessons often overlooked or passed over in western history lessons. You'll find yourself overwhelmed with devastation, and a visit to either of these sites is not easy, but it is a key part of the city's history and, in turn, it's future. 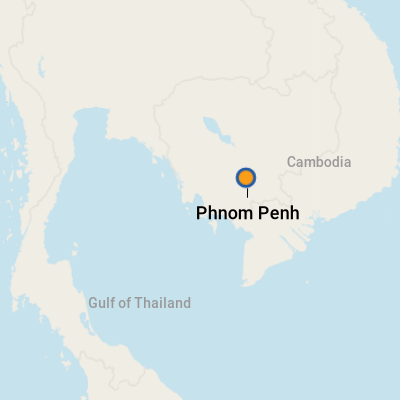 There are two main ports in Phnom Penh -- the Phnom Penh Autonomous Port and port 2. Most river cruise ships dock at the Autonomous Port, which sits just a short eight to 10 minute tuk tuk ride from the center of the city. In addition, you can walk to the Central Market, the main pagoda or the gold leaf-decorated Royal Palace in just 20 minutes. An ATM sits right outside of the port, making it easy to withdraw money as soon as the ship docks. In addition to tuk tuks, rickshaws and motorbikes, taxis are always plentiful in and around the port to transfer you anywhere you'd like to go. Note: The port does lock the main gate at 11 p.m. If you feel like walking, the area around the port boasts plenty of street carts serving Cambodian specialties (think grilled chicken feet), small shops offering some authentic (and some rather kitschy) souvenirs, trendy bars and even some of the city's more famous sights, like the Silver Pagoda. Like many Southeast Asian capitals, motorbikes and mopeds are everywhere, traversing the roads with reckless abandon. One thing to note -- it may seem like there's no rhyme or reason to the motorbike traffic, but they've got it down to a science. It's easier to watch locals cross the road or ask your tour guide the safest way to get across. On Foot: The great thing about many of Phnom Penh's main sights are that they are all within walking distance of each other. If you're up for it, depart the port and walk for 20 to 30 minutes to get to the Central Market and waterfront park, 15 minutes to get to the Silver Pagoda and around 20 minutes to reach the Royal Palace. In addition, a walk to and from the Raffles Hotel (a popular spot for sipping cocktails) is only about 20 minutes from where ships dock. By Tuk Tuk: One of the easiest and most affordable ways to get around Phnom Penh is on a motorized tuk tuk, which comfortably sits two to four people. In addition to affordability, these are the most reliable and safest modes of transport in the city, and plenty can be found around the main port, near the markets and around the main sights -- like the Royal Palace or the Silver Pagoda. Have your ship guide or concierge call a tuk tuk so you can ensure you're getting the best rate (most will negotiate on your behalf so you're not swindled). In addition, many tuk tuk drivers will only charge around $10 or so for a two-hour tour of the city, which can help orient you to where the dock is and where the main sights of the city are located. By Pedicab: For a ride that's a little more relaxing than the speedy, exhaust-fueled motorized tuk tuks, hop on a cyclo, or a pedicab. The ones in Phnom Penh offer a comfortable seat so you're able to put your feet up and relax as the driver pedals through the city's busy alleyways and neighborhoods. Since the driver is pedaling, you won't find a cyclo that's willing to do the tours that tuk tuks are, but it's an easy and more affordable method (usually only $5 to $10) to get from point A to point B. As a note, pedicabs are typically only available during the daytime since it can be dangerous for both the driver and the passenger late at night. Cambodia's currency is the riel. Check www.xe.com for current rates. However, most vendors, restaurants, hotels and even the temple complexes take (and prefer) U.S. dollars. It's advisable to carry ample small bills, which come in handy for tipping, buying water and tuk tuk or taxi rides. It's also advised to bring enough money to get you through your stay ahead of time (as ATMs are often out of order or not government mandated), however, there are still banks available if you need to safely withdraw money. The traditional dialect of Phnom Penh (and most of Cambodia) is Khmer, an interesting language that blends the influence of Sanskrit and Pali, as well as dialects from the neighboring countries of Laos, Vietnam and Thailand. Although most tour guides, hotel employees and temple workers do speak conversational English, it's best to learn a few key words and phrases in Khmer as the level of English varies by person. If you've been to Thailand or Vietnam, you may notice quite a dramatic difference in the flavor and the heat of Cambodian fare. Unlike these neighboring countries, who rely heavily on fresh chilies, garlic pastes and spicy sauces, Cambodian dishes are far more moderate, with just a small hint of spice and more of a creamy flavor and texture (thanks to the addition of rich, full-fat coconut milk). Typical dishes you'll find on almost any Cambodian menu are crispy tofu tossed with rice (vermicelli noodles), chicken mixed with coconut milk and fresh coriander (or cilantro) and even crispy bugs (think crickets or ants) served over a bed of rice. Their desserts are some of the best in Asia, with sweet palm sugar candies, pumpkin cakes, coconut milkshakes, lemongrass ice cream and succulent cakes, found at almost any market or restaurant. Regarding drinks, Cambodia has some of the region's best (and strongest) coffee, so you'd be remiss not to order a few espressos (from the market) to fuel your day. They're also known for their locally brewed beer and spirits (like their infused rice wine and local beers made from wheat and rice), so if you can, grab a libation at lunch (we love the Phnom Penh brews or the Golden Muscle Wine). Romdeng: Situated in a beautifully redesigned colonial house with a pool flanked by candle-lit tables and a lush garden near the National Museum, this insanely popular eatery functions under the same non-profit umbrella as Friends the Restaurant, offering jobs and training to Cambodia's underprivileged. The cuisine is more Khmer based and offers guests a chance to taste some of the country's infamous signature dishes -- like fermented fish paste or crispy fried spiders. For those a little less adventurous, don't fret -- the restaurant also offers plenty of milder dishes, like crispy fried, Cambodian-spiced chicken wings served with pickled crab and a green papaya salad; Tonle river fresh fish soup served alongside green banana, tamarind and spicy basil or the student favorite duck breast served with red ant soup and winter melon. Like Friends the Restaurant, most of the proceeds go back toward helping the former street kids who are now employed at the restaurant. The best gifts and souvenirs are often found in the city's markets, and that couldn't be more true for Phnom Penh. The main market, Central Market, was built in the 1930s by a French architect and features an open design with hundreds of vendors selling everything from silk scarves, elephant-printed pants, Buddha statues and fresh fruit, fish and an array of street food. Most people pick up a pair of the soft pants, as well as some hand-crafted jewelry, which all sit in cases in the covered portion of the market. Beware of knock-off jewelry, and only buy from an authentic buyer. If you're lucky, you might even walk away with 100 percent jade pieces. For a more historical souvenir, pick up a book or brochure from the Tuol Sleng Genocide Museum so you can read more about the complicated and devastating history of the country. For a great selection of scarves, other clothing items and more discount goodies (from dishes to bowls to postcards), visit the Russian Market, which is located on St. 155. It was dubbed the Russian Market in the '80s because the bazaar was most frequented by Russian visitors, but now it's a popular spot for anyone to go antiquity shopping. If you're looking for the city's most legendary cocktail, the only place to go is the Elephant Bar at the iconic Raffles Hotel. U.S. former First Lady Jacqueline Kennedy spent a few days in this five-star hotel, and ordered her favorite tipple -- a Femme Fatale -- while listening to one of Norodom Sihanouk's jazz renditions on the hotel's grand piano. The drink, which blends sparkling wine, brandy and strawberry liqueur, is decorated with an ornamental flower and served in an old-fashioned Champagne flute. A Femme Fatale costs a pretty penny, but the bar's ambiance, which feels like a renaissance French nightclub, and the refreshing cocktail make the price tag worth it.